Preheat oven to 350F. Combine oats, flour, brown sugar, baking powder and salt in large bowl. Stir in butter until mixture is crumbly. Reserve 1 cup crumb mixture; set aside. Press remaining crumb mixture onto bottom of an 8-inch square pan. Bake 10 minutes. 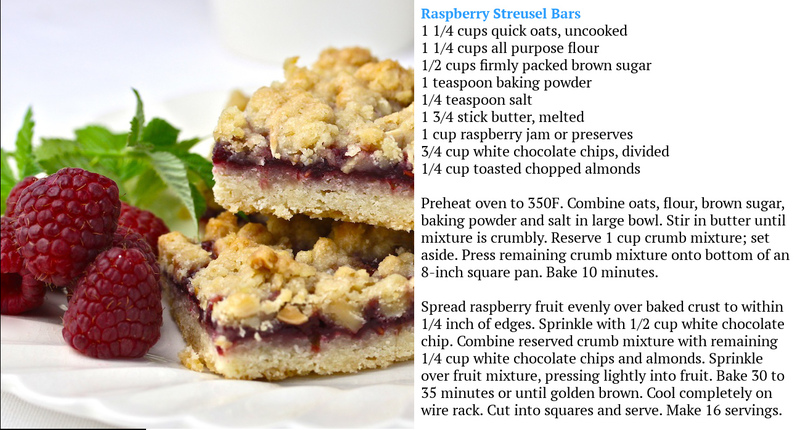 Spread raspberry fruit evenly over baked crust to within 1/4 inch of edges. Sprinkle with 1/2 cup white chocolate chip. Combine reserved crumb mixture with remaining 1/4 cup white chocolate chips and almonds. Sprinkle over fruit mixture, pressing lightly into fruit. Bake 30 to 35 minutes or until golden brown. Cool completely on wire rack. Cut into squares and serve. Make 16 servings.